LOS ANGELES – May 17, 2018 – The Original Venice Crew (OVC), which builds the official continuation 1965 Ford Shelby G.T. 350 Competition Model, has thrown down the gauntlet in the name of charity to Aston Martin and Jaguar. During a press event in Southern California today, OVC CEO Jim Marietta reignited the rivalry with these two European automakers. The Original Venice Crew is challenging them to race their continuation heritage classic cars against the classic Shelby continuation model. Marietta is asking both Aston Martin and Jaguar to bring their continuation builds to Willow Springs Raceway in Southern California. There, with drivers designated by their respective teams, the three cars will compete for 10 laps, winner take all. If either the Aston or Jaguar beat the 1965 Shelby OVC G.T.350, the Original Venice Crew will donate $100,000 to the charity of the winner’s choice. And if the Original Venice Crew were to win, the OVC team will donate $35,000 to the Carroll Shelby Foundation among other charities. 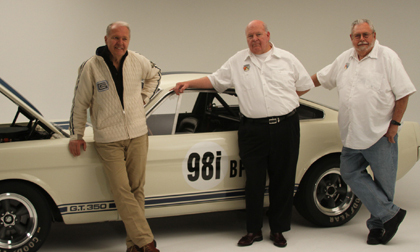 The group who built the first series of Shelby American racecars based on Ford’s iconic ‘65 Mustang fastbacks and hail as the “Original Venice Crew,” is producing a limited series of the famous racers in Southern California. These new, specially-authorized versions of the 1965 Shelby G.T. 350 Competition Models can be optioned with a race-focused independent rear suspension originally designed in 1964 by Ford Advanced Vehicles. Only 36 of these very special cars will be built, each incorporating several aerodynamic and design enhancements by the Shelby American designer Peter Brock. The continuation cars are licensed by both Carroll Shelby Licensing and the Ford Motor Company. At roughly the same time as OVC began reconstructing Shelby G.T. 350’s, enthusiasts at Jaguar and Aston Martin were revisiting their competitive histories. The results of those examinations are continuation examples of both the Le Mans-winning D-Type Jaguar and Aston Martin’s DB4 GT. Some 62 years after the last D-Type Jaguar was built in 1956, Jaguar Classic has restarted production of the iconic D-type race car in the Coventry factory in England. From both a design and alphabetical standpoint, Jaguar’s D-Type served as a bridge between Jaguar’s Le Mans-winning C-Type of the early ‘50s and the production E-Type, which made its debut in 1961. Dominating the 24 Hours of Le Mans from 1955 thru 1957, the D-Type Jaguar serves as a reminder of Britain’s postwar success. It also illustrates how racecar design – at that time – could influence the engineering of a production car. Just 25 examples of the D-Type will be built, fully a third of the 75 original D-Types completed. Notably, Carroll Shelby had little direct experience with the D-Type, other than the occasional dusting of one. Shelby was much more closely connected to Aston Martin, having shared the 1959 Le Mans win in an Aston Martin DBR-1 with driver Roy Salvadori. However, it is not the DBR-1 that Aston Martin is recreating. The DB4 GT continuation car is the quintessential grand tourer built for competition, providing an absolutely unique combination of performance and luxury. It was a car rarely, if ever, equaled at the time of its introduction in 1959. And like Jaguar, only 75 examples were built between its launch and the end of ‘production’ in 1963. With cost of both the continuation Jaguar and Aston Martin well into seven figures, the price tag of the OVC Shelby Mustang, which starts at $250K, is modest in comparison. The ‘us vs. them’ and cubic inches vs. cubic money are only two of the pillars for the challenge proposed by the Original Venice Crew. Regardless of who wins the event, the OVC challenge represents a unique way to turn back the clock, a chance to revisit a moment in time, like Camelot, when only dialog was analog. While the world still has, and hopefully will always have, classic Astons, Jaguars and Shelby Mustangs, the intervening 50 years have civilized the resulting vehicles. While the challenge is intended to recall the past, the planned proceeds will go far in moving the selected charity forward.